Thoracic Herniated disc or in the thoracic region of spine takes place when the inner core of the vertebral disc starts leaking out to the outer core which in turn irritates or press on the nearest spinal nerve root causing thoracic pain. 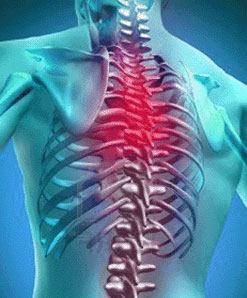 This can happen due to degenerative disc disease or an injury to the upper back. Apart from causing upper back pain, herniated disc also causes other symptoms like numbness and weakness not just in the back but also the shoulders and arms. Injury or trauma to the upper back –Usually injury that is caused to the spinal column like falling from a height or an automobile accident causes the intervertebral discs getting herniated. Degenerative Disc Disease – Another main cause of herniated disc is gradual wear and tear or degeneration of the discs that often leads to the calcification about the disc space as well as the settling of the vertebral bodies. All these activities as well as treatment therapies not just relief symptoms of herniation but also help in prevention of further damage to the intervertebral discs.